New numbers are streaming in. If you could see my computer screen right now you would see that I have 10 tabs open in my browser looking at the models and comparing them. I have said for several days that there are two key periods of time I was looking forward to looking at the model data. When the storm moves on shore the models will be able to get better observations to chew on in the calculations. When the storm exits the Rocky Mountains. The storm has moved onshore and is moving across the southwest United States. The new models tonight are trending the system a little further north. 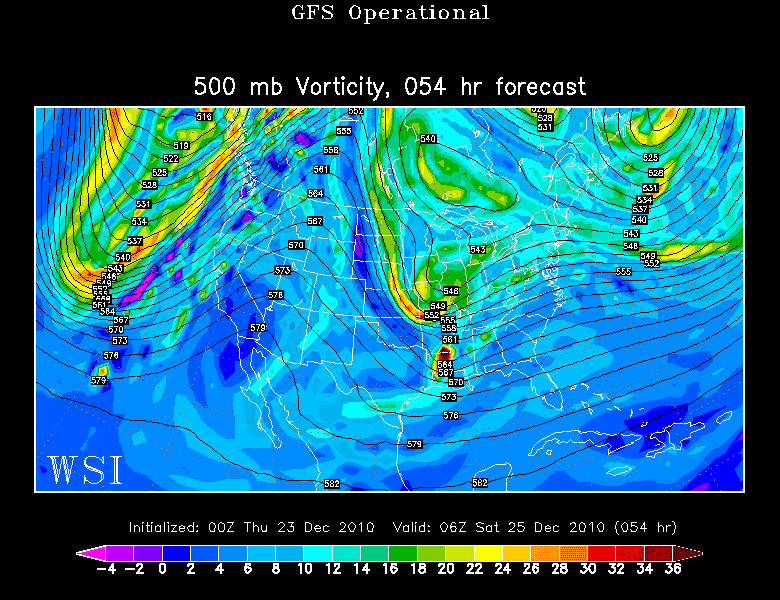 The models are also continuing to split the energy of the storm. There will be a southern branch, where the majority of the moisture will be located and a northern branch. Lets look at the upper-levels of the atmosphere. Here is the new 0z Global Forecast model from the NWS. This is looking at 500mb or approximately 18,000 feet up in the atmosphere. 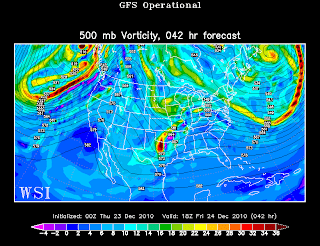 Here is the 42 hour (12pm CT Friday) chart. 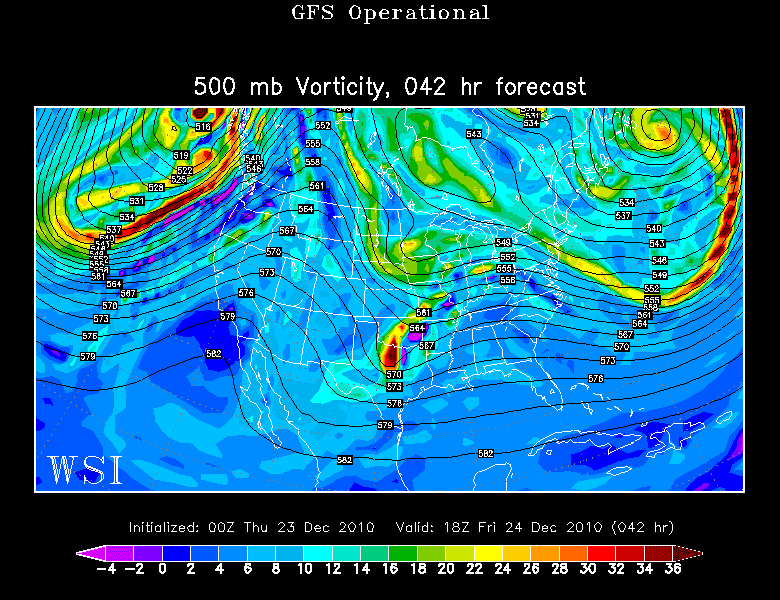 When looking at the above chart the northern piece of energy is located over Minnesota. The southern piece of energy is over northern Texas. Here is the 54 hour (12pm CT Saturday) chart. The northern piece of energy is over Iowa and the southern piece of energy is over northeast Texas. Right now my feeling is that we could be between the two pieces of energy. The models are also trending further north with the precipitation. Not only is it trending further north but the amounts are also a bit higher. 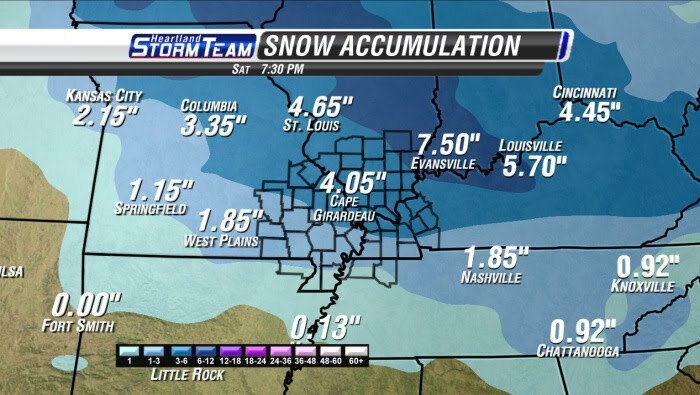 This would mean potentially more snow for the area. Lets take a look at a couple of the computer models' snow accumulation maps. Before I show these, I want to remind you that these are numbers straight from a forecast model and may not be what happens. That is why there is a difference between our forecast and the model output. Here is a look at the 0z RPM model. The 0z NAM is also taking numbers up dropping anywhere from 0.5" to upwards of a 6" band of snow through the middle of the KFVS viewing area. I, along with several other NWS offices, think the NAM is an outlier. The new 0z GFS has come in indicating a general 1" to 3" snow over the area. Here is a look at a couple of the meteograms for a few locations across the KFVS viewing area. The meteograms let you see both the NAM and GFS runs in one screen so you can compare. I will be interested to see what the new run of the European forecast agency's computer model shows. A conversation I have been having with a good friend of mine, who is also the Chief Meteorologist at a television station in Indianapolis, has been dealing with tonight's new data. One thought/concern we have both have is that it has been raining cats and dogs over southern California all day. Could the heavy rains introduce some problems for the models? This could explain the higher precipitation amounts. This is similar to the spring and summer time when we often have convective feedback issues with the models. Or perhaps the models are on to something? Only time will tell. I wish I could give you better details or insights in to what we are going to see Friday/Saturday, but at this point I don't have them. This is still a very fluid situation.